A joint team comprising personnel from Mount Leuser National Park and the Langkat Police has arrested three members of an alleged Sumatran tiger poaching group in protected forests within the national park in Marike subdistrict, Langkat, North Sumatra. The poachers and a dealer face a maximum of 5 years in prison and a USD $10,000 fine. Hundreds of seized items from illegal wildlife trade destroyed in Banda Aceh. Intense pressures mean that less than 100 Sumatran Tigers are left remaining in the Leuser Ecosystem, and only 400-500 are left on the planet. Groups of poachers of rare and endangered Sumatran tigers are believed to have long been operating in the protected forests. Mt. Leuser section V head Palber Turnip said the alleged tiger poachers had long been targeted by rangers for hunting endangered species in the national park. He claimed to have evidence of the sales of endangered species. “I once pretended to be a buyer when a suspect claimed that he could provide me bear and deer pelts. All the pelts offered were from rare animals they obtained from hunting in the national park,” Palber told The Jakarta Post on Wednesday. He said the arrests were made following a tip-off from residents that a person intended to sell a tiger pelts and other organs. Based on the information, added Palber, the joint team then moved to the location, with one team member pretending to be a buyer. “The price agreed to for the tiger skin and other organs was Rp 42 million [about US$3,139]. The transaction and handover of goods were carried out in a plantation around the Marike subdistrict,” Palber, a member of the joint team, said. Based on the agreement, they met with a group of three alleged poachers in a plantation in Marike on Tuesday afternoon. When the suspects showed the tiger skin and other organs to the undercover officer, the other team members immediately arrested them. “The three poachers did not resist arrest. They were immediately taken to the Langkat Police station for processing,” said Palber. The suspects, identified as Dedi, 25; Ledes, 28; and Hendra Tarigan, 25; are all from Bahorok subdistrict, Langkat regency. Langkat Police detective chief Adj. Comr. Agus Sobarna Praja said that based on questioning, the suspects did not work on their own and only served as intermediaries. 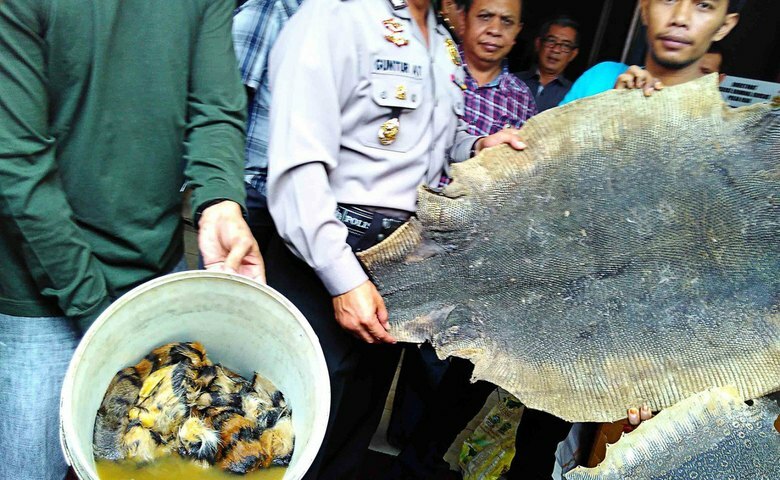 Dedi said that the tiger skin had been obtained from a person named Bukti Sembiring, who was still at large. Bukti is suspected to have hunted the wildlife by trapping and then handing the caught animals to the suspects for them to sell. “He often hunts tigers in the national park and offers the pelts at Rp 25 million,” said Dedi at the Langkat Police on Wednesday. Poaching of endangered Sumatran tigers is rampant in the national park. Sumatran tigers are hunted and killed not only for their skins but also their organs. Three members of a Sumatran tiger skin trading network were arrested recently and sentenced to two years in prison. The estimated population of Sumatran tigers in GLNP is worryingly low at about 100 individuals. Two arrests have been made since 2015 for tiger trafficking inside the Leuser Landscape. We are working with various agencies to combat this activity, as well as removing tiger snares through regular patrols. The species' alarming rate of population decline is caused by poaching. The Langkat Police announced that they arrested tiger hunters who were caught trying to sell tiger fur yesterday. The fur had belonged to young tigers aged around 5 years old. "The tigers they killed are teenagers because the fangs are hollow and the bones are small," he said. The poachers were selling the fur, fangs and bones of those teen Sumatran tigers for Rp42 million. "We hope that Sumatran tigers can live safely and comfortably in Mount Leuser National Park. No more poaching as we discovered on Tuesday," he said.